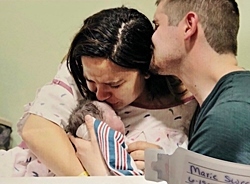 Katherine Grace Sweezer, precious infant daughter of Jordan and Marie Sweezer, went to be with Jesus on Friday, June 15, 2018, 7 1/2 hours after birth. Besides her parents, Katie will be lovingly remembered by her brothers, Jordan Thomas, Jr. "JJ", and Caleb Joseph; her grandparents, Pastor Rick and Maria Miller, Cristina Herron, Jason (Kelly) Sweezer; her uncles and aunts, Thomas Miller, Anna VanWieren, Owen Sweezer, Olivia Sweezer, Oliver Sweezer; and many other relatives and family friends. The family will greet visitors on Saturday, June 23, from 10 - 10:45 am at Grace Immanuel Reformed Baptist Church, 860 Peachcrest Ct. NE, where the service will begin at 11 am. Pastor Jeff Johnson and Pastor Matt Vincent will officiate. Interment will be at Dutton Cemetery. Memorial contributions may be made to HeartCry Missionary Society. "What we have once deeply loved we can never lose, for all that we love becomes part of us."